Crazy that Rufio has released an album this amazing after seeming to hide out for so long! 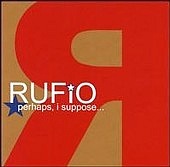 "Perhaps, I Suppose", Rufio's first full length release is remarkable and intense. Although some of the song's beginnings are a bit comparable to Blink 182 or New Found Glory, the rest of their music is completely innovative, mind blowing, punk. Rufio, from the outskirts of L.A., is made up of Scott Sellers, Jon Berry, Clark Domae, and Mike Jemenez, who apparently fashioned into Rufio because they were a bunch of bored kids who thought it would be cool to be in a band. Since then, they have distinguished themselves as completely skilled and talented musicians. "Perhaps, I suppose" is captivating, complete with enchanting harmonies and elegiac lyrics like, "Trapped inside your eyes, gleam like stars above, emptiness inside. Caught inside of your arms, warmer than the sun, never felt so full. I don't understand, I embrace every thought, every word." Some of the other lyrics are a little bit corny...always a good sign. The paramount songs on this album are #1 "Above Me", #5 "She Cries", and #13, "Tears". "Above Me", is the most unsurpassed love song that I've heard in years. It's fast pace, but still remains to be incredibly romantic. In this song, Rufio refers to a girl as "The angel above me", which is a title that I'm sure any girl wouldn't mind having. Clark Domae's guitar playing is polished to perfection, while still searing enough to make you want to headbang and jump around like a maniac. "She Cries", is an amazing song about "One too many times, he's beaten you down to the bone. Stay away he said, don't ever come back home. She cried away her days that last so long alone. Stay Away. Weakened from the pain that he left in her heart. Fallen in the rain, her whole life has fallen apart." It's truly a ground breaking and captivating piece that addresses the troubling emotions that a girl is left with after saying goodbye, and evokes only the deepest sympathy and compassion. Scott Seller's distinctive voice is heartening and when Jon Berry joins in with his faint back-up vocals, he adds a unique charm and appealing aspect to Rufio's music. "Tears", is incredible, with elegiac lyrics that also talk about intense emotion: "Tears are mixed emotions, tears are more than tears. The pouring rain from my eyes means too much to keep inside. I sit and watch you leave my life forever...It's the light behind the shadow, the sacred face behind the mask." The enchanting harmony is overwhelming and creates an unmistakable imagery. Honestly, I don't know how Rufio could get any better. They are so talented and have such ideal chemistry together...I'm sure we'll be seeing much more from them in the future, and that we won't be disappointed.